As a mom-ographer, I rarely have time to go grab my big “fancy” camera and fiddle with the settings. So most of the time, the best way to capture my own kids’ childhood memories is with my iPhone. My girls are less likely to argue or "strike a pose" for my iPhone. I tend to get more natural, candid, every day lifestyle shots of their cuteness this way. To help you capture your "sweetlife", I've compiled a quick list of tips for how to take better photos of your kids using your iPhone. Artistically, photography is referred to as "painting with light." The BEST natural light occurs during the golden hours of the day - first thing in the morning while the sun is coming up or the hour or so before sunset. The light is much softer and provides a nice even, warm glow. During other times of the day when the sun is harsher, find open shade when your outdoors or look for diffused directional light coming in from windows or open doors if you're shooting indoors. Swipe up from your iPhone's Lock screen and you can quickly take that picture with no significant wait time. You can also do something similar while in an app or on your Home screen by swiping up from the bottom of the screen to launch Control Center, then tapping on the Camera button. The built-in camera on your phone will let you touch the screen to set where you want it to focus. 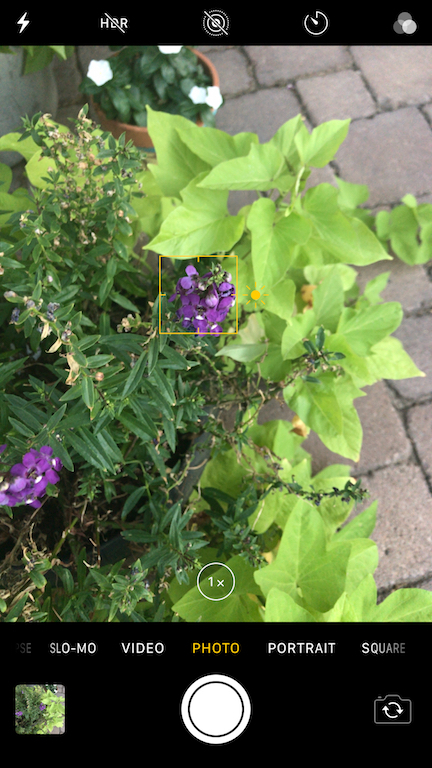 You can tap the subject in the photo if you want to auto-focus on their face, or touch the closest thing on the screen to adjust the depth of field (that cool blur you see behind the subject - see image example). I like using Portrait Mode on my iPhone 7 plus to get extra "blur"- just swipe left when you're on your camera screen. You can also lock in your focus but tapping and holding the yellow box. To release, tap anywhere else on the screen. Let's say you're composing an image and it is too bright or too dark (in photographer speak we say blown out or underexposed, respectively). You can fix it before snapping the picture by adjusting the yellow exposure slider next to the focus square. Just tap once on the yellow focus square. You'll see little sun icon just to right of the square (see image). To increase your exposure (make it brighter), slide the sun up. To decrease exposure, slide the sun down. Have you ever noticed that when you whip your phone out, your kids hide their faces or run away? Maybe it's your attitude. Kids are intuitive and can read your mood. Want them to be silly and playful? You need to be silly and playful. Staying aware of your mood will help set them up for photo success and make capturing those precious moments of your kiddos tons easier. I hope these quick tips help and inspire you to start snapping! Now, go capture some childhood memories!